This year’s theme was “Rebuilding The Wall.” It’s not clear what the wall represents but given that speakers included Mat Staver, the frankly ridiculous Benham Brothers and Janet Boynes we can safely assume it’s a giant fence of ignorant bigotry holding back a growing tide of common sense and acceptance. 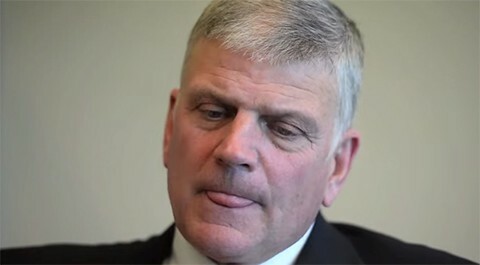 Right Wing Watch reports that the best received speaker was Franklin Graham (above), son of hate speaker Billy. “Let me tell you something. A lot of pastors have quit preaching against homosexuality. You know why? I’ll tell you why. Because they are afraid that there may be some man or woman in the congregation whose son or daughter is gay. “Don’t shut up, guys. You don’t shut up. If the people that are coming after you, ‘yak, yak, yak,’ and they want to run you out of church, then let them run you out of church. Go to another church, let them have that church. I’ll tell you what, God will bless you and he’ll honor you if you speak up and you tell the truth. Last year, old charmer Graham praised Vladimir Putin for his moral treatment of homosexuals as pedophiles and said that gay people don't "adopt" children so much as "recruit" them.